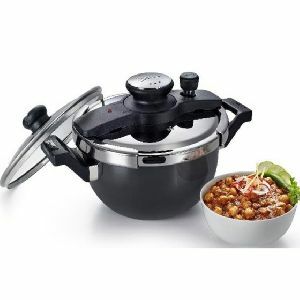 This is a new prestige pressure cooker. 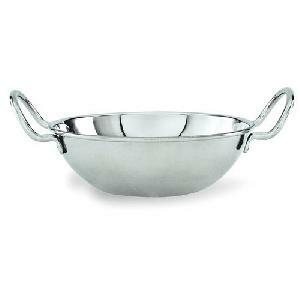 The lid can be placed in any position and be closed safely. And yes, this lid comes with pressure indicator that also acts as a lock ensuring maximum safety while pressure cooking. 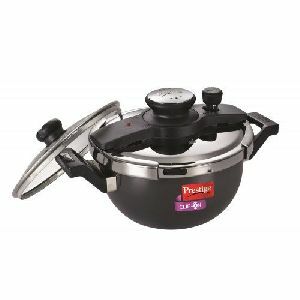 This prestige pressure cooker range is modular by design, meaning you can use the same unique lid on all the utensils in this range. 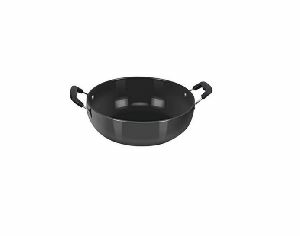 We export an array of Hard Anodized Deep Kadai that is highly efficient and endures heat at maximum level at the time of cooking. Fabricated using finest quality raw material, our array is widely preferred in domestic and commercial kitchen. 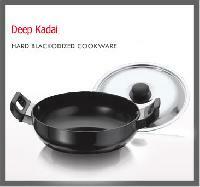 We are offering hard anodized deep kadai. 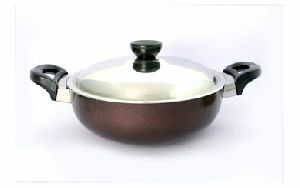 Aluminium hard anodized deep kadai with s.s lid. Sizes : 10inch, 11inch, 12inch, 13inch, 14inch, 15inch, 16inch, 18inch. We are offering hard anodized kadai size 250 mm dynamiter, stainless steel lid, hard anodize coating, one year products warrant, 3.0 mm thickness, wooden paam and wash crube free, products code tpk. 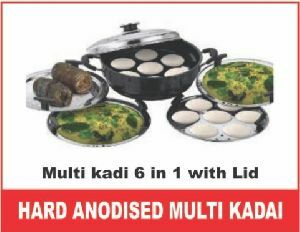 We are among the leading manufactures, importers, exporters and suppliers of Hard Anodised Deep Kadai . 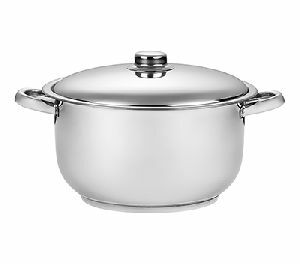 We offer a wide variety of hard anodised cookware. They are manufactured using high grade material. It incorporates heavy duty handles which makes it easy to handle. 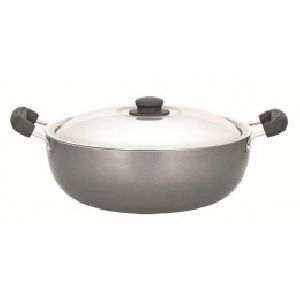 The hard anodised cookware offered by us is of unmatched quality. Pick the casserole that will suit your need! Designed to keep your food warm, these durable and sturdy casseroles offer a hot meal every time. Ranging from different sizes and lid, each piece is crafted to last long. Using the lid brings the food to a boil faster, and you save time, energy and money. 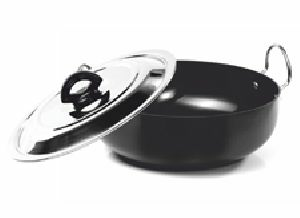 Placed amongst the foremost suppliers, we are a far-famed for the outstanding Non-Stick Deep Kadai. Quality raw materials have been used for the production of our entire range. As a dependable name, we procure these raw materials only from trustworthy sources present in the market. 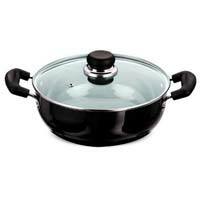 Non-Stick Deep Kadai has a smooth and polished surface with high dimensional accuracy and a long service life. * encapsulate bottom. * can be used in both induction and lpg stove. *made from high quality stainless steel *comfortable handle and knob. *energy efficient encapsulated base that means food can stay warmer for longer time and saves fuel. *note: do not heat or use empty or dry utensils as it may damage the capsule bottom surface. 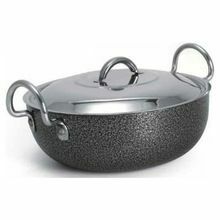 Aluminium kadai available in all sizes flat bottom induction based with heavy thickness in 4 mm thickness. 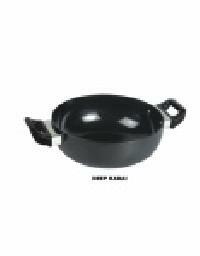 We are an eminent and leading manufacturer, supplier, trader and exporter of Deep Kadai in India. 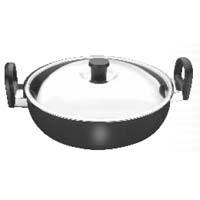 A well recognized non stick deep kadai supplying company.